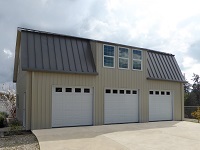 Bolt & screw together construction means your building goes up quickly. No welding. No heavy equipment. Cast-in-place means no anchor bolts required. Requires up to 25% less concrete. Goes up fast. 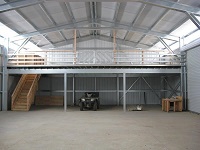 The engineering and foundation drawings are included for local building codes! 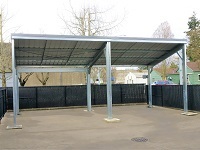 Rust resistant, all galvanized G90 steel frame. Non-combustible. Insect resistant. It’s steel. Fire resistant. Non-combustible. Steel frame, steel bolts, steel sides, cement foundation. 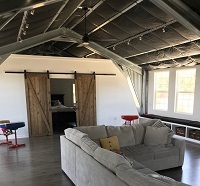 Full or partial mezzanine for storage, or for living. Lean-to attachments. 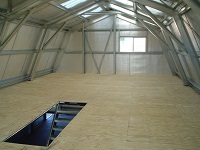 Interior partition walls. Entry doors. Garage doors. Windows. Spans from 12′ to 80′ clear. Or 120′ posted by any length. Endless uses including: Garages. Showrooms. Offices. Cabins. Barns. Storage Buildings. Stables. Utility Buildings. We get so many requests to do this. Yes you can! We can help. Any size to contain anything you want to build or work on. Put living quarters above. 45 years on all painted metal panels. Highest in the industry. 25 years on all unpainted metal panels. Steel lasts. Come see our display! Tell us your needs. 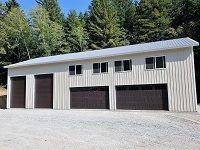 Let Kelseyville Lumber design your steel building. We’ve done many. Enjoy perspective drawings from our 3D engineering design software. Once you approve the design and the cost, everything is delivered to your job site quickly. 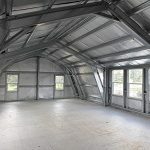 You will have a brand new building quicker and for less money than other options. 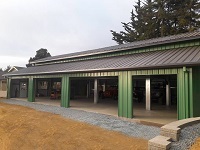 Call 707-279-4297 and ask for the Steel Buildings experts. How You Will Use The Building?